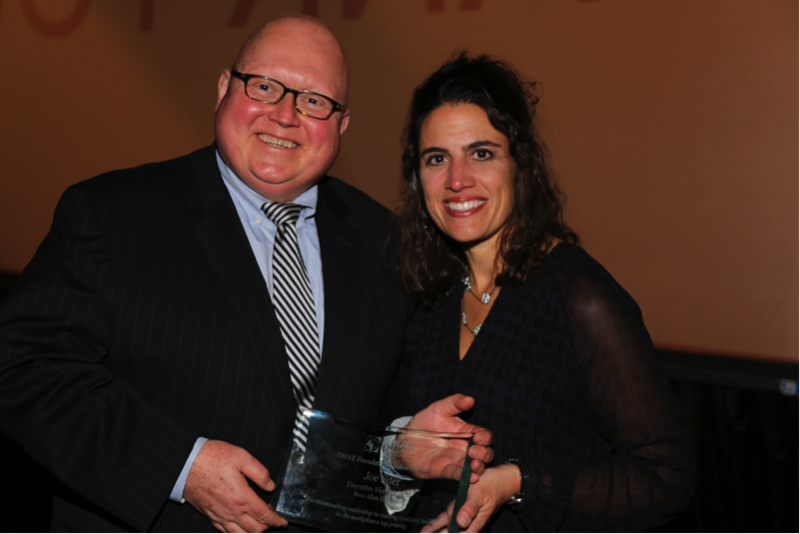 On Monday, April 25, Joe Sifer, Executive Vice President, was honored at the DMAX Foundation Spring Fundraiser. Mr. Sifer received the DMAX Foundation Leadership Award in recognition of his outstanding leadership in making emotional health a priority in the workplace. DMAX Foundation is dedicated to eliminating stigma and encouraging safe and caring conversations about mental health issues and emotional pain in our youth. “For this award, we looked for a company that is facing down the stigma of mental health in the workplace. Our research led us to Joe. He is not only working to improve the emotional fitness of Booz Allen employees and to create a compassionate environment for those suffering from mental health - he’s also been instrumental is forming important partnerships with organizations like The Campaign to Change Direction and Give an Hour, ” said Laurie Burstein-Maxwell, Executive Director of DMAX Foundation. Booz Allen is committed to changing the culture around mental health and emotional wellness. We want our employees to recognize when they are in need, look out for those around them, and know where to reach for help. We offer free counseling services through our Employee Assistance Program (EAP) and have made emotional fitness a core pillar of our employee wellness program, PowerUP. The firm also joined the national campaign, Change Direction, which seeks to create a common language around mental health with the five signs of emotional suffering. Booz Allen is proud to support organizations like DMAX Foundation and Change Direction. One in every five people have a diagnosable mental health condition. Changing the conversation around our emotional wellness is critical to health and wellbeing of our employees, and millions of Americans like them.